WorkflowGen is a web-based business process management software that helps organizations to streamline their business processes and workflows. The software supports almost all functions within a business unit including HR processes, sales & marketing, finance, IT governance, compliance and corporate services. WorkflowGen can be used for creating new product templates, generating manufacturing orders, inventory management, master data management, product lifecycle management and quality control. The tool also helps in finance & accounting processes such as invoice processing, loan processing, capital appropriation, procurement, CAPEX management, and purchase requisition. Marketing and sales operations such as lead management, proposal generation, order processing, product launches and customer care are also supported by this product. WorkflowGen supports single sign-on and automatic authentication, customized workflow portals, real-time monitoring of workflows and access to statistics and graphical reports. The software helps in risk and compliance management and is compliant with regulations such as Sarbanes-Oxley, HIPAA and ISO 17799. Security management process, risk analysis and management, authorization, access controls and reporting are other features offered by this product. WorkflowGen is a .NET web-based application that can be installed on web servers and allows end-users and administrators access to the software on their web browsers and mobile devices. The software is used by over 500 clients and one million end-users in more than 70 countries. Some of its customers include Comcast, Deloitte, XL Group, University of Minnesota, Time Warner Cable, Sanofi Pasteur, and Textron Systems. Please note that this review was performed based on WorkflowGen v5.6.4. WorkflowGen version 6 and 6.01 released in May 2015 are addressing most of the perceived limitations presented in this review. Many thanks to our Client for sharing his experience. ● Use the WorkflowGen .NET workflow software's low code environment to maximize the efficiency of process designers and developers. ● Automate any type of human and system-based enterprise process within a battle-tested infrastructure. ● Customize and integrate your workflow apps to meet your requirements in a highly configurable environment. Engage process participants with a full-featured workflow portal, native mobile apps, and email approvals, or through seamless integration with your own web apps. ● Leverage a solution used by Fortune 500 companies for worldwide business-critical applications. Below are some frequently asked questions for WorkflowGen. Q. What type of pricing plans does WorkflowGen offer? Q. Who are the typical users of WorkflowGen? Q. What languages does WorkflowGen support? Q. Does WorkflowGen support mobile devices? Q. Does WorkflowGen offer an API? Yes, WorkflowGen has an API available for use. Q. 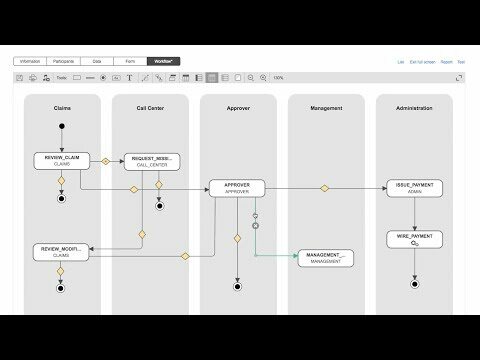 What other apps does WorkflowGen integrate with? Q. What level of support does WorkflowGen offer? Q. Which apps is WorkflowGen compared to most often?